“Tasunka: A Lakota Horse Legend” is featured in the November Artful Stories program at the Michael C. Carlos Museum, located on the campus of Emory University in Atlanta, Ga. The multi-award-winning South Dakota State Historical Society book, written and illustrated by Oglala Lakota artist Donald F. Montileaux, has received high praise since its publication in 2014. In addition to reading “Tasunka,” participants will create a pictorial shield based on an artifact at the Carlos Museum by Joseph No Two Horns, the man who is believed to have carved the South Dakota State Historical Society’s Great Sioux Horse Effigy. The effigy recently returned from a two-year world tour and is on display at the Cultural Heritage Center in Pierre. “Tasunka” is a story of adventure, discovery, loss and renewal, set to beautiful illustrations that illuminate the story of the horse and its importance to the Plains people. Readers journey with a young warrior as he tracks a strange new creature across the Plains and discover the destructive nature of power as well as a lesson in redemption. Montileaux uses traditional storytelling methods to impart wisdom to new generations, and through the Lakota translation by Agnes Gay, “Tasunka” preserves an important piece of Lakota culture. “Tasunka” is dedicated to Alex White Plume, who first told the legend to Montileaux. 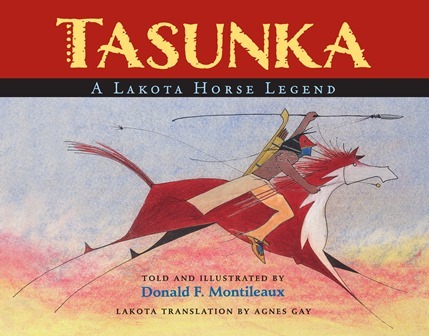 “Tasunka: A Lakota Horse Legend” is available for $19.95 plus shipping and tax and can be purchased from most bookstores or ordered directly from the South Dakota Historical Society Press. Visit www.sdhspress.com, call (605) 773-6009 or email orders@sdhspress.com. To find out more about the Carlos Museum and its exhibits, please visit www.carlos.emory.edu.